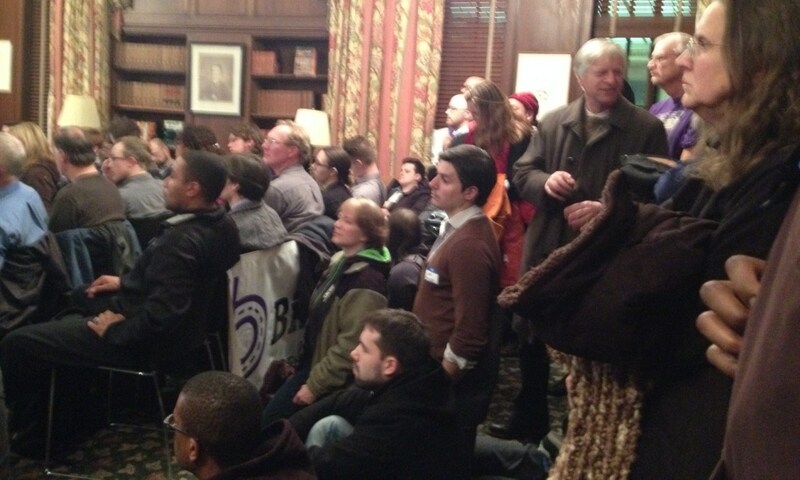 In the Enoch Pratt Central Library’s Edgar Allen Poe room, an overflowing enthusiastic audience witnessed history. 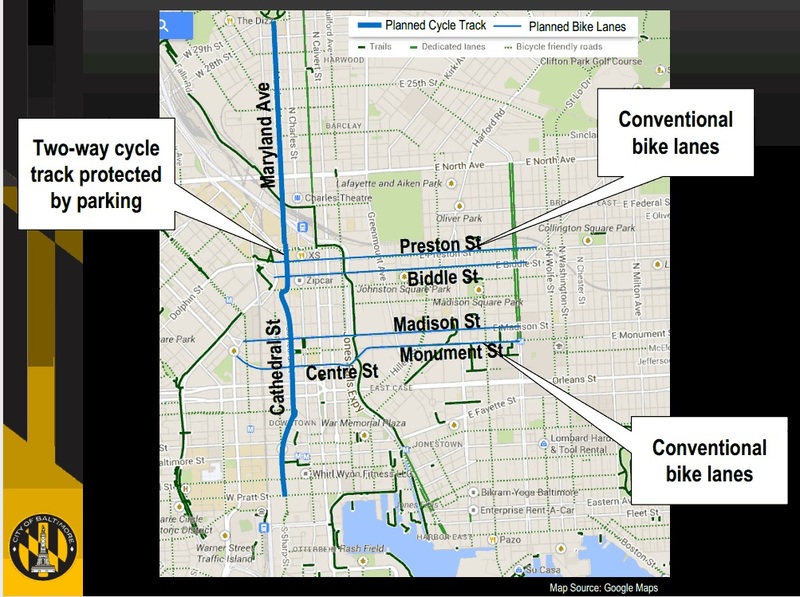 The Baltimore Department of Transportation (BDOT) planners presented the “Downtown Bicycle Network“, a plan that could catapult bicycling forward in the central business district (CBD) and city. The plan’s signature infrastructure piece is Baltimore’s first ever cycletrack ranging 2.6 miles from near Johns Hopkins University in the north to the convention center near the harbor on Maryland Avenue. Installation is to take place in fall 2014. A cycletrack is a leap beyond today’s on-road bicycle investments in the city. 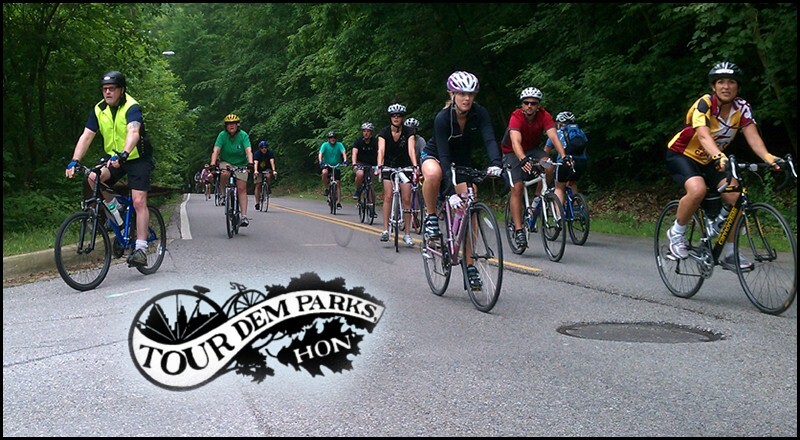 Baltimore bicycle enthusiasts look to DC with both envy and inspiration. The hope is, the Maryland Avenue cycletrack will prove popular enough to open the door for building a bicycle system on par with the District. Will the Downtown Bicycle Network actually serve downtown? While its name is the “Downtown Bicycle Network,” the projects are mostly actually in Mt. Vernon, a neighborhood to the north of the central business district. The cycletrack will get a bicyclist downtown, but for now that is where the network ends. A Pratt Street cycletrack could provide an east/west complement to the north/south Maryland Avenue Cycletrack. Pratt Street is the main artery of the business district and because of its width and concentration of businesses, hotels, tourist attractions, and facilities like the convention center and institutions like the University of Maryland, it remains the grand prize for a cycle track. Bikemore, Baltimore bicycle advocacy organization, is pushing this idea. Image: Pratt Street in Baltimore. The south lane (on left) is a bus/bike lane. Photo by author. 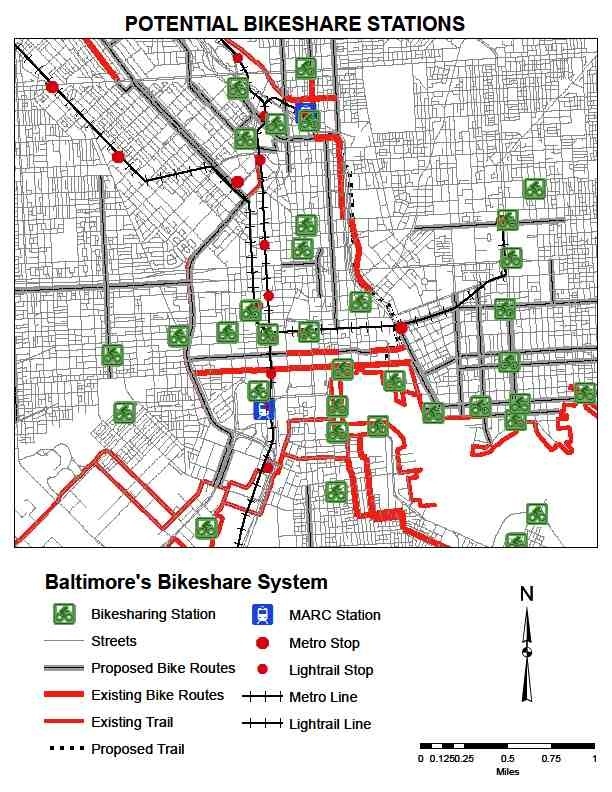 Officially, Baltimore’s bike map lists bus/bike lanes on Pratt Street. However, these lanes are not often enforced and not comfortable for many bicyclists. 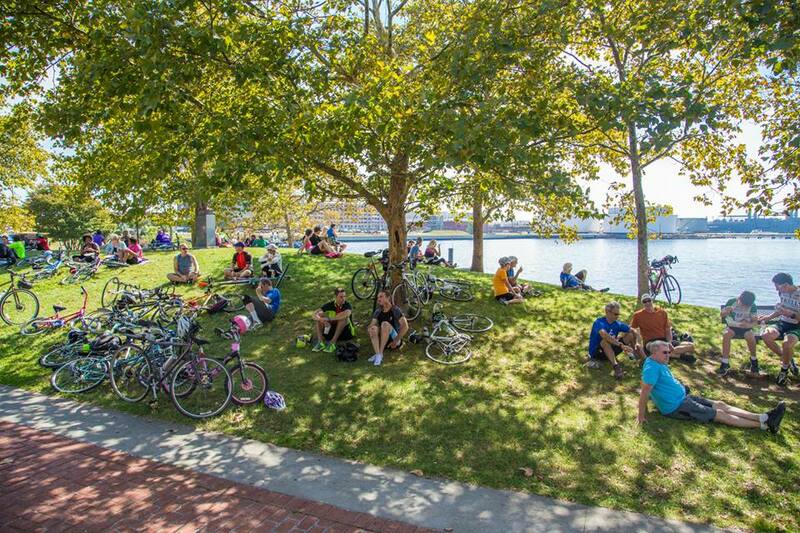 Some maps and officials also tout the Inner Harbor Promenade and the Jones Falls Trail adjacent to Pratt Street as bike facilities. 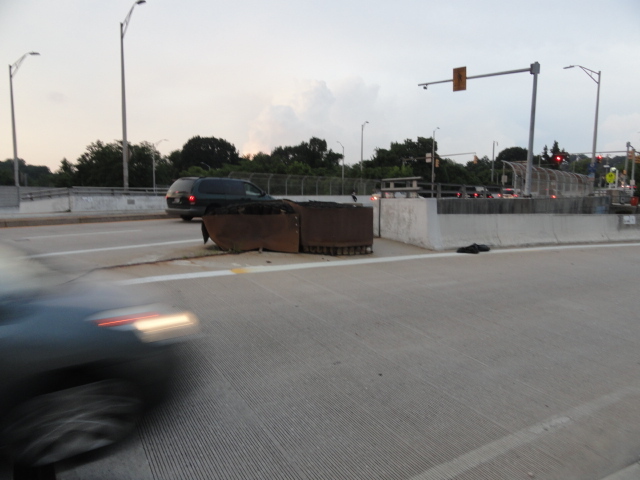 But in summer, they are often packed with tourists, strollers, pedestrians, and are often impassable for bicyclists. If not for Bixi’s financial troubles, it is likely Baltimore would have Bikeshare by this summer. 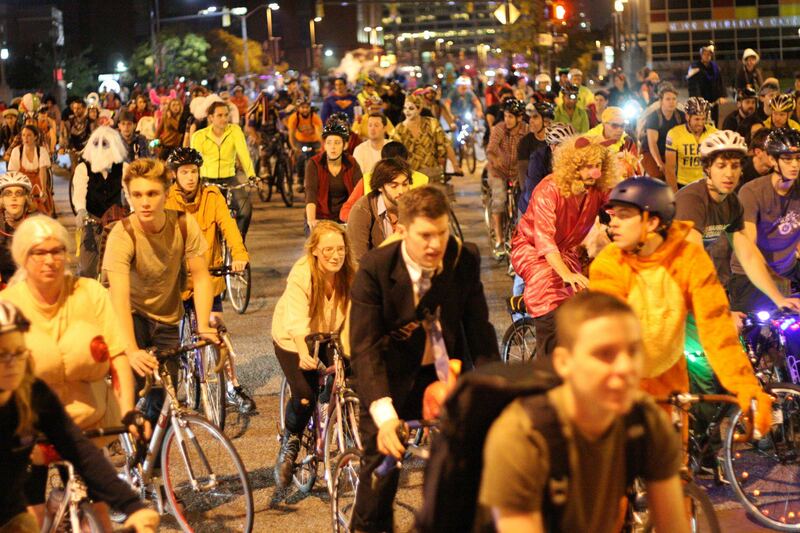 Hopefully, Baltimore can use the delayed launch to continue to build a better network to support cycling. The better the infrastructure, the better bikeshare will work when it eventually launches. Washington is not the only nearby city for Baltimore to seek inspiration. 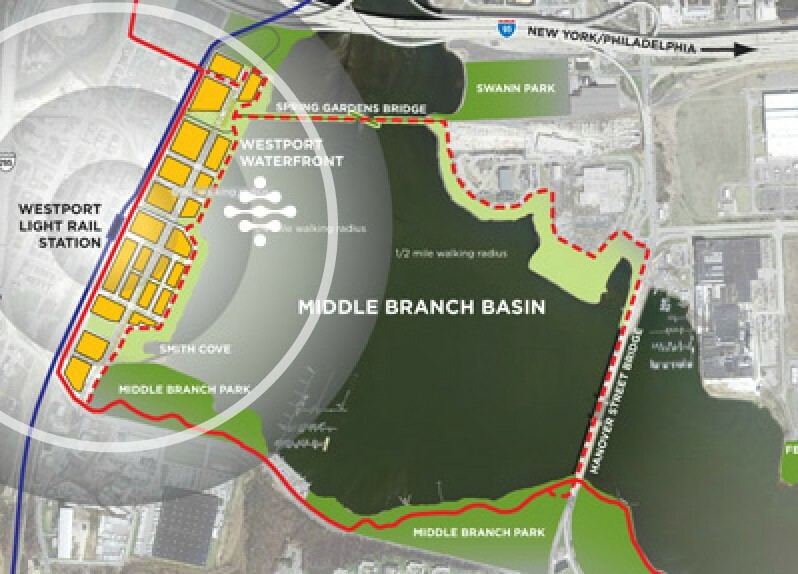 Pittsburgh has integrated quality bike facilities along its water front and made connections to nearby neighborhoods. 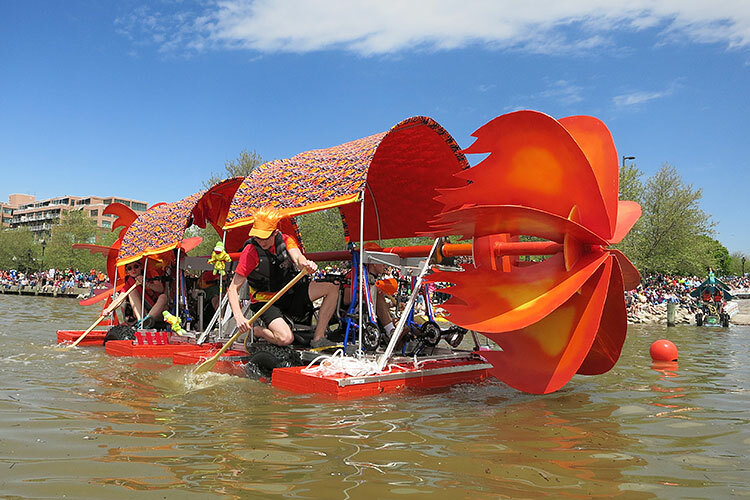 In a Pittsburgh Magazine article about the steel city’s revitalized river front, Lisa Schroeder, president and CEO of Riverlife, likens the increased traffic along the riverfront to the growth of the regional trail network. “The more trail that was created, the higher the number of users was,” she says. “We hit that momentum point along the rivers this year. People realized, ‘Aha — this is a network, and I can go in all directions.’ Bill Peduto, Pittsburgh’s new bicycle-friendly mayor wants his city to be in Bicycle magazine top ten US cities, despite its hilly contours. Will the Maryland Avenue Cycletrack be the first of a series of complementary projects, extensions, and improvements to Baltimore’s bicycle network? The fast growth of DC and Pittsburgh’s network make us optimistic that charm city will catch the momentum too. My son is off to start high school as a freshman in three weeks at Baltimore’s Polytechnic Institute (Poly) High School. I was excited that he would have an easy bike ride to school. 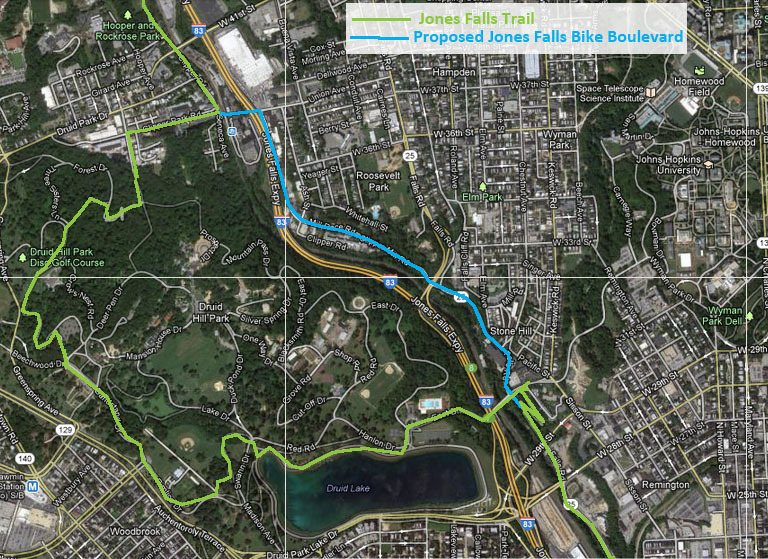 The newly created Jones Falls Trail would get him 90% or 0.7 miles from his high school. I thought it would be a bicycling slam dunk. I went out to inspect and whoa, not so easy and not so safe…. The last leg is comprised of crossing a highway interchange, hyper fast speeding vehicles, and scary street crossings. As parents, we are going to have to veto this bike route to school. 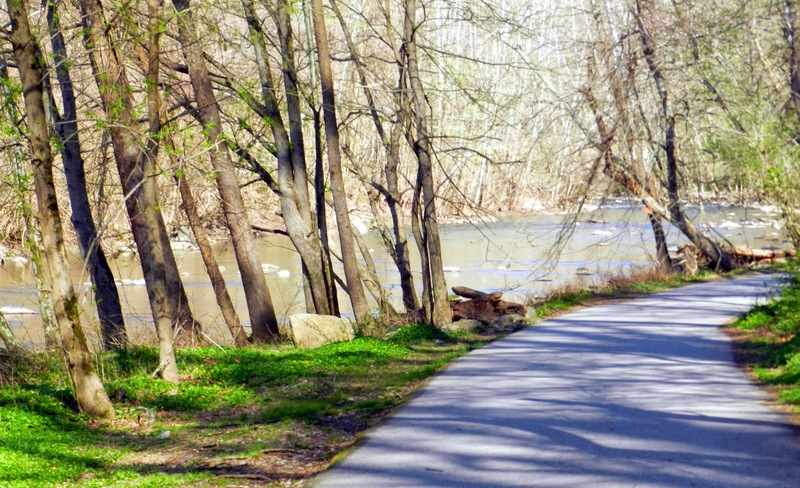 If Baltimore, Maryland, and the US gets serious about making bicycling a mainstream transport option the trails are going to need spurs that safely connect to the places we go. Trails like the Jones Falls should find tentacles that reach schools and neighborhoods that are nearby but not connected. A safe spur from the Jones Falls Trail to Poly (and Western) under the elevated portions of the expressway (JFX) could probably be built for under two million dollars. 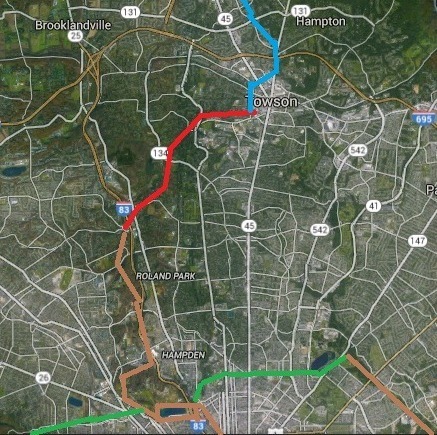 The connection would also provide access to neighborhoods (Cross Keys, Roland Park, Medfield) that are currently blocked to the trail by the expressway. Because of the scarce dollars allocated to bike infrastructure, I am not necessarily arguing here for this specific project . ( “Safe Routes to Schools” funding is regularly on the Congressional chopping block) Unfortunately, bike planners have to make priorities that make ubiquitous safe connected networks seemingly decades away. Maryland Counties have highway interchanges on their priority list projected to cost $140 million and more. These may or may not be worthy projects. 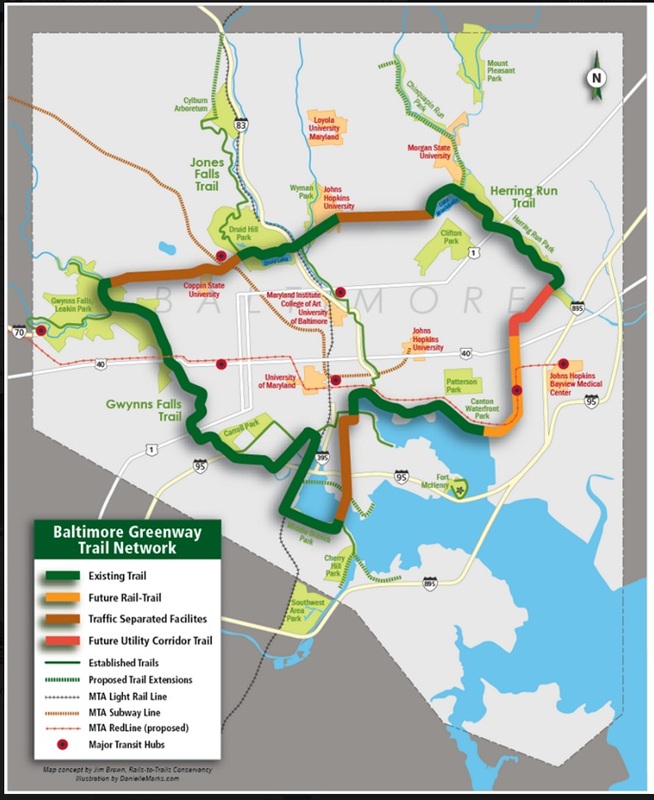 The hypothetical two million dollar trail spur connection between Baltimore’s north-south spine trail to Baltimore’s Math and Science High School and three adjacent neighborhoods is probably considered too expensive to build. 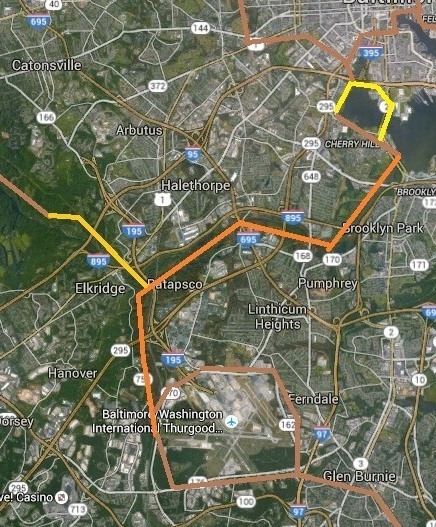 As I see a highway interchange prevent my son from easily bicycling to school, it does make me wish one proposed highway interchange in Maryland could be sacrificed so dozens of safe networks of trails could be built linking Maryland’s communities and their schools. (Baltimore City’s Transportation Priority Letter emphasizes Transit Oriented Development (TOD) projects, but lists no bike paths among its priorities. Ironically, the letter does focus on a TOD adjacent to the Cold Spring Station and interchange. The letter describes the Jones Falls Trail as “value added.” Today, the Jones Falls Trail passes within 70 yards of the Cold Spring Light rail stop, but does not connect. 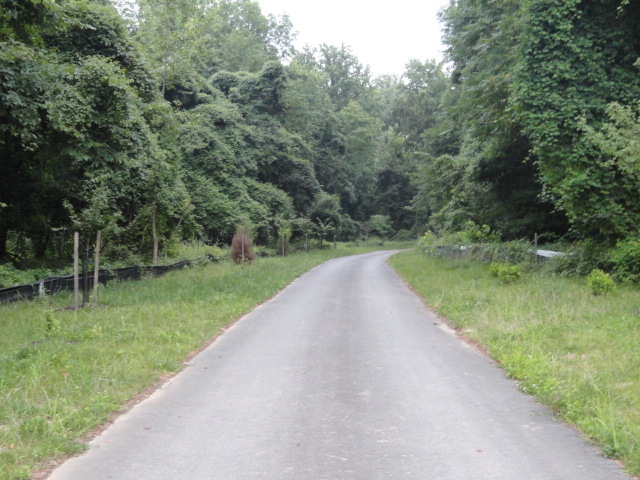 A spur from here to the forest on the other side of the highway would connect three neighborhoods and two high schools to Baltimore’s north south Jones Falls Trail. Baltimore Poly, the city’s math and science magnet school. Western HS is also here.